Many organisations such as schools, colleges and clubs in the UK can be eligible for polymeric surface funding to get help with financing a polymeric sports court surfacing project. Funding organisations offer grants to institutions with inadequate sports facilities who do not have the budget to pay for the construction of a new sports facility themselves. 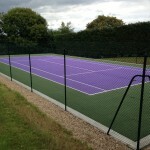 The polymeric surface funding can be made available for the installation of a range of sports surface including tennis courts, netball courts, athletics tracks and multi use games areas. Having a brand new sports facility or multi use games area is a great way to engage kids at school and get them into participating in a wide variety of sports all in one place. This means that the polymeric surface funding opportunities are very important and can help drastically transform sports facilities for children throughout the UK. Feel free to contact us if you’d like some more information on what we offer and how we can help with funding. Athletics facilities such as long jump runways and running tracks can also be installed with help from funding grants. These facilities are commonly installed in polymeric surfacing for high schools and athletics clubs, but are becoming increasingly popular at primary schools as they can be installed with needlepunch fibre bonded material to provide a softer landing surface. Schools and clubs who apply for funding and are accepted for a grant can receive financial help to install one of these polymeric sport surfaces which will greatly improve the sports facility of the institution and can be enjoyed by everyone for a long time. If you’re interested in applying for a funding grant to get a polymeric sports surface installed, please fill in our contact form with your details and we’ll get back to you with some helpful advice regarding specifications and the financial help you may be eligible for. You can find more information about polymeric sports surfacing throughout our website so please take a look through it and make yourself aware of all the options that are available to you.